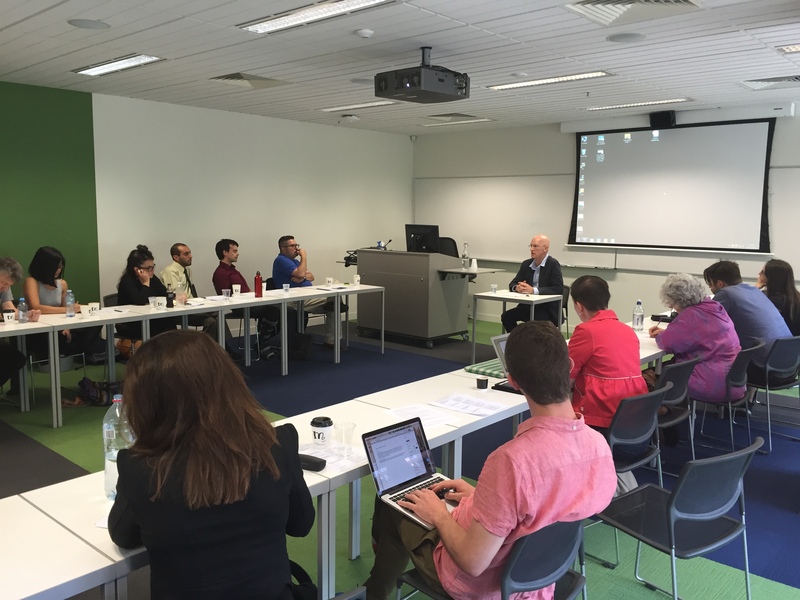 On the 28th of November 2014 the TASA Cultural Sociology Thematic Group hosted a symposium on ‘Cultures of Authenticity’ at Flinders University in Adelaide. The event was organised by TG convenors Sara James and Nicholas Hookway. TASA granted funding for two postgraduate scholarships, which were awarded to Lisa Farrance and Ramon Menendez. Our thanks go to Eduardo de la Fuente, Brad West and Nick Osbaldiston for their assistance in facilitating the symposium; to John Carroll who gave a key-note presentation; and to Claire Baker whose reflections of the day can be found below. The difficulties involved in pinning down exactly what is meant by ‘authenticity’ was evident in the different approaches taken by each of the speakers at the Cultural Sociology Thematic group’s Cultures of Authenticity Symposium held on 28 November, 2014. The day presented a fascinating array of material and highlighted the interplay of internal and external referents in the search for authentic experience and ways of being. There were 14 presentations from a mix of early, mid and senior academics, including a keynote presentation by Professor John Carroll. The morning session highlighted the differing conceptions of authenticity of place, and that the subjective interpretations of authenticity attributed to these spaces influences both the actions borne of and the meaning drawn from these interactions in and with place. The session included presentations from Eduardo de la Fuente on the difficulty of maintaining authentic experiences of culture in a globalising world of increasingly homogenised aesthetics; Brad West presented on the dialogical remembering of the American war in Vietnam as a quest for authentic meaning for the tourist; and Nick Osbaldiston drew a link between differing forms of place-based rationalisation and ideas of the ‘authentic’ beach. The second session looked at the central role of authenticity in religious and cultural identity and expression, including presentations by Steve Taylor who drew upon understandings of authenticity within the context of alternative worship; Naama Carlin whom problematized the social marking of circumcision within Jewish communities and the effects this has for authentic religious identity; and Ramon Menendez Domingo presented a qualitative study that considered cultural background and individual understandings of authenticity. The keynote presentation was given by John Carroll, and remains an intriguing and thought-provoking memory of the day. Taking Shakespeare’s line “All the world’s a stage…” as the centre of his meditation, John’s presentation spanned a metaphysical sociology of art that interrogated the twin concepts of an authentic self as an indicator of moral character and virtue, and the notion of life as a pageant, itself an essential fabrication that enables reflection and access to deeper existential truths. This use of dramaturgical analysis provided an interesting backdrop to the development of the idea of the way in which un-real or hyper-real (in some sense, then, in-authentic) spaces hold value in their ability to reveal the importance of authenticity, including Marcus Maloney’s exploration of video games as a mode of narrative from which participants can draw authentic emotional experiences despite illusory autonomy; Tim Graham’s observation of the illusion of authenticity online through his critical analysis of review and recommendation constructs; and Shai Diner’s analysis of the role of authenticity in traditional Columbian music. The final session of the day saw presentations that each looked at authenticity and gendered experience. Lisa Farrance presented on the use of personas in the roller derby scene to empower participants toward an authentic embodied experience of themselves; Tamika Sharrad explored how female firefighters challenge notions of authenticity in a professional field marked, deeply and internally, by the male norm; Akane Kania’s presentation considered self-branding through an appeal to authenticity to differentiate feminine identities on Tumblr; and Annette Mallon presented on the difficulties inherent in any authentic female identity performance. Thus the papers presented throughout the day provided a wide-ranging field of reflection on the cultures of authenticity. Ultimately authenticity is positively valued and presented as analogous to virtue, present when what we observe is judged to hold with some ideal – whether this be an internal value of integrity or some external normative criterion. Crucially, the day revealed the insight held within John Carroll’s speech: that of the basic human need for the pageant (the in-authentic fabrication) as a mode of reflection upon the failings and accomplishments of our authentic character and our authentic experience in the search for authentic meaning. We all thank the Cultural Sociology thematic group leaders Sara James (LaTrobe) and Nicholas Hookway (UTas) for organising such a valuable and thought-provoking symposium for the group.